Also known as the Eibl’s Angelfish, Eibl’s Pygmy Angelfish, Orangelined Angelfish, Blacktail Angelfish, and Eibl’s Dwarf Angel, its pearlescent body is highlighted with several vertical, evenly-spaced orange to red stripes. The very back of the body and caudal fin are black. A brilliant sapphire-blue stripe outlines the caudal fin. 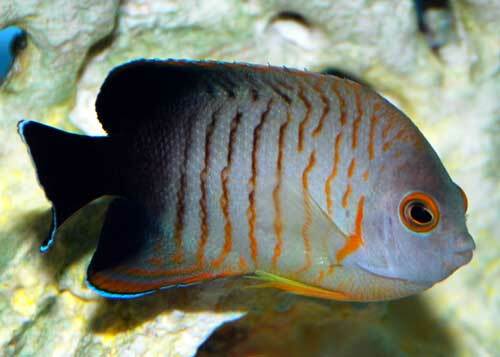 Red Stripe Angelfish requires a 70 gallon or larger aquarium with large amounts of live rock for hiding and grazing. With a tendency to be docile, the Red Stripe Angelfish can become more assertive once established. Like all angels, some will pick at corals and clams, so they need to be watched when placed in a reef tank. They also well in FOWLR tanks and get along with most other fish of different size and temperament. They do best in established tanks, whether reef or FOWLR tanks.